Skills required: cable cast on, knitting, purling, increasing, decreasing, picking up stitches, working a slip-stitch textured pattern (explanations provided), binding off, working an I-cord (explanations provided), making a sewn buttonhole loop (link to tutorial provided). Construction: This cardigan is knit seamlessly from the top down. Sleeves are worked in the round. Stitches are then picked up on the front edges and collar to work the edging. 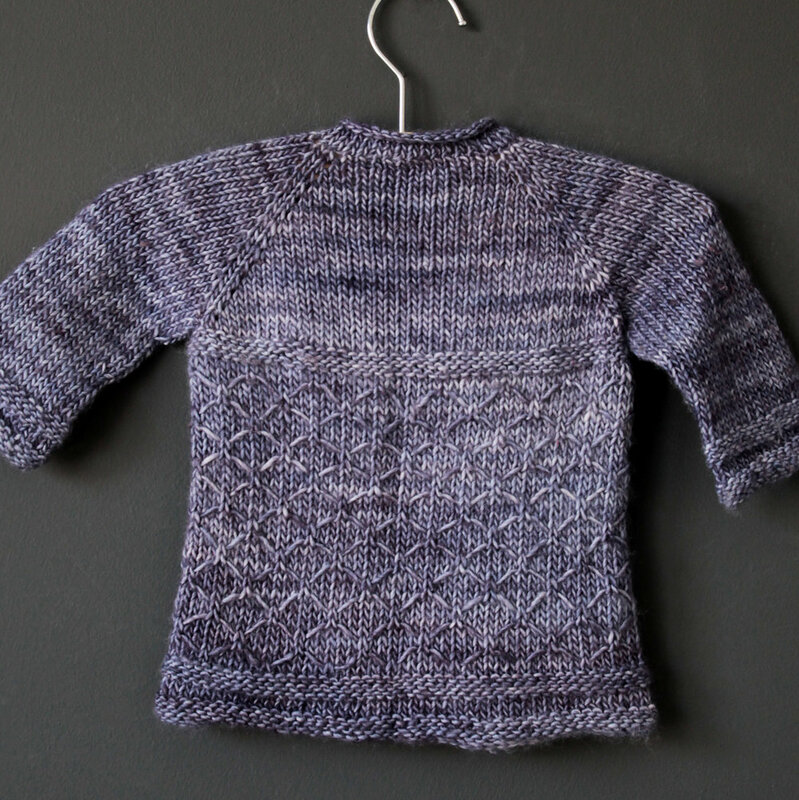 A very fun, seamless knit, Kyoto features an easy yet interesting lattice-like stitch. It made me think of a kimono or a samurai armor, so I named it Kyoto, a beautiful and mysterious city. Finished garment has chest measurement of 18 (19, 21, 22, 23 // 24, 24.5, 26.25, 28.5) inches or 46 (48.5, 53, 55.5, 58.5 // 61, 62, 66.5, 72.5) cm. Yarn Requirements: 1.5 (1.5, 1.5, 1.75, 2 // 2.25, 2.5, 2.75, 3) skeins of Madelinetosh merino DK 100% merino; 225yd/206m per 100g/3.43oz skein or approximately 300 (350, 350, 400, 450 // 500, 550, 600, 675) yds or 275 (320, 320, 365, 410 // 460, 500, 550, 615) meters of similar DK weight yarn. Note: this pattern would look great in a variegated yarn. US8 or 5mm circular needles or size needed to match gauge (for body).